The award is based on reviews from couples who have had their weddings at the hotel throughout 2017. The hotel was also selected as one of the top five wedding venues in Ireland. The awards come on the back of the hotel having received the title of ‘Luxury Hotel and Spa of the Year’ by Luxury Travel Guide. The Lough Rea Hotel is fast becoming one of the premier wedding venues in the country. The quality of service that the hotel offers, combined with dedicated staff, fine food, unique features and special touches that make a wedding day so special, were the main reasons that the hotel received so many positive reviews from couples. The Rooftop Garden and luxurious bridal suite with panoramic views of Loughrea Lake were singled out by couples that held their weddings in the hotel as outstanding features. Other aspects of the hotel that stood out were the Shore Island Spa, the food and the service provided by the ever attentive staff. 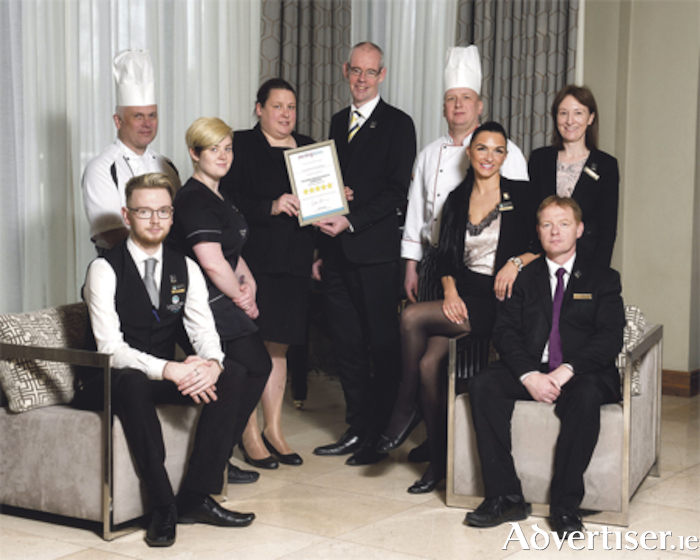 “We are honoured to have received not one but two prestigious awards recently,” hotel owner and Só Hotel Group managing director, Pat McDonagh said. “We are delighted to have won the Wedding Dates award for the third year in a row and the fact that these awards are based on reviews by couples that had their weddings in the hotel is particularly satisfying. Lough Rea Hotel & Spa is hosting an exclusive wedding fair and fashion show on February 11, from 1pm to 5pm, where attendees will meet the hotel’s wedding team and be in with a chance of winning a bespoke Gráinne Seoige Grace Diamond Engagement Ring worth €5,000. The hotel is taking wedding bookings for 2018 and beyond, with some outstanding packages that can be individually tailored to suit couples’ requirements.